Do you ever get a hankering for certain foods, like a cup of steaming hot soup on a cold and drizzly day, the silky smooth and rich taste of chocolate ice cream, the salty crunch of potato chips, the sour crispness of a pickle spear? The human palate, or the way we humans develop our sense of taste, is an incredible and fascinating process that has kept us alive for centuries. The human tongue has some 2000 – 8000 taste buds, which are the location of taste receptor cells or gustatory cells. These cells detect (or taste), the five elements of our taste perception; salty, sweet, sour, bitter, and umami, which is the savory taste associated with broths and cooked meats. When parts of food dissolved in saliva come in contact with these taste receptor cells, information is sent to the gustatory area of the brain, cataloged, and filed for future reference. Other factors that affect a food’s flavor include aroma, texture and temperature. In studying human nutrition, I learned that infants have an innate preference for sweet taste, and that sweet, salty and fatty foods are universally desired. Many people have aversions to bitter and sour tastes in isolation, but enjoy them combined with other flavor elements. Over many generations, our taste buds have been used to guide us in judging whether a food or combination of foods in a recipe is acceptable and pleasurable to eat. The more we humans taste, the more we develop our taste buds, the more enjoyable becomes the process of eating. 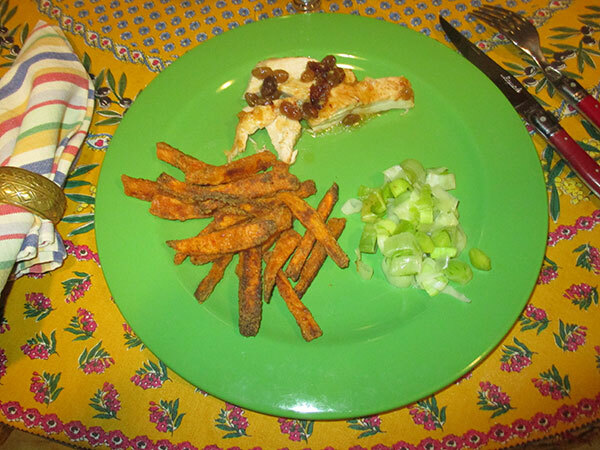 My latest taste obsession is sweet potato fries. The sweet potato, domesticated in Central America thousands of years ago, is one of human’s oldest vegetables. 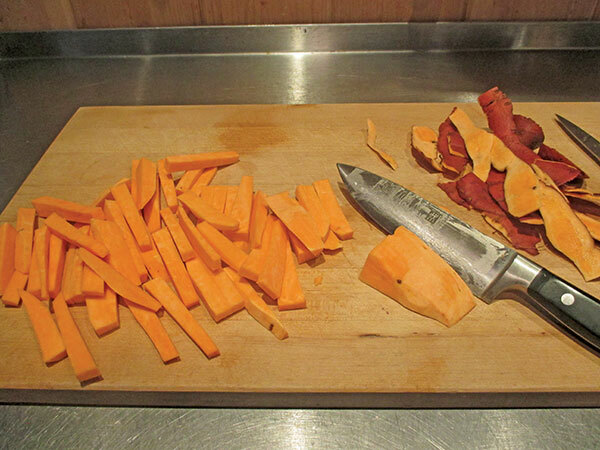 A super food; the bright orange flesh of sweet potato is packed with nutrients, vitamins and fiber. Grown primarily in more southern climes, but now also here in Maine, properly cured tubers will store in a cool (around 50 degrees) and dry location until summer. Here at Rabbit Hill, I keep sweet potatoes from Beech Hill Farm in a wooden box under the bed in an unheated bedroom. 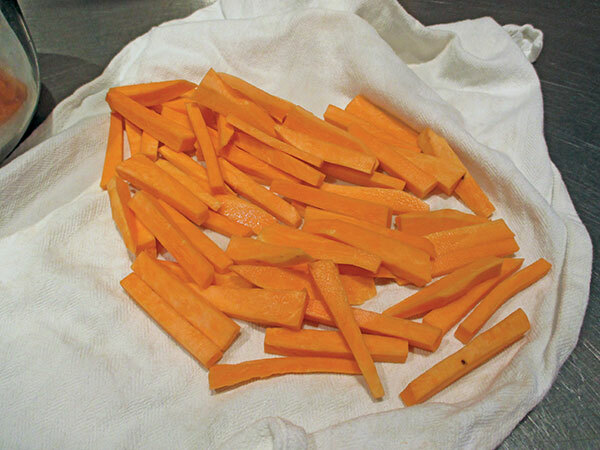 For my palate, a proper sweet potato fry is crispy on the outside with a hint of spicy heat and salt, and moist, sweet and delicious on the inside. No soggy, greasy fries! 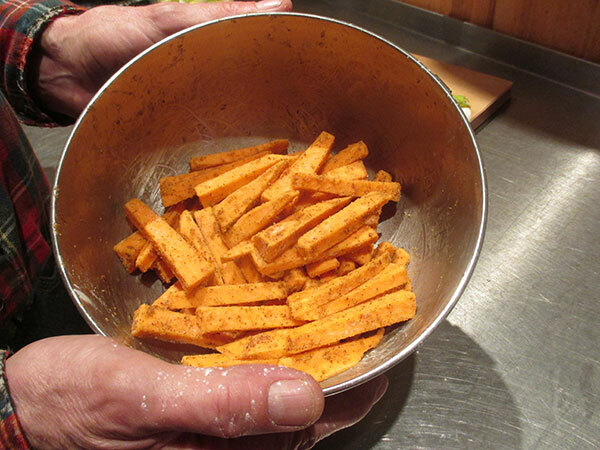 The recipe for Baked Sweet Potato Fries comes from an internet search. Seems other folks taste buds desire the same components. 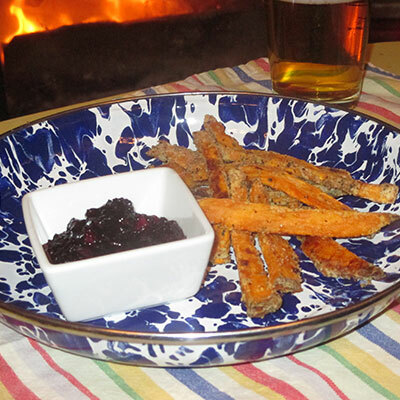 Delicious as a snack, tasty for supper, pairs well with a beer, I found so many ways to enjoy Baked Sweet Potato Fries. Be careful! These fries are extremely easy to make, allow for plenty of cooks creativity, and sinfully addictive. These addictive fries are tasty and crispy treats! Preheat the oven to 425 degrees. Line a sheet pan with parchment paper. Scrub and peel the sweet potatoes. Cut them into evenly sized pieces; long, thin strips that are evenly wide. 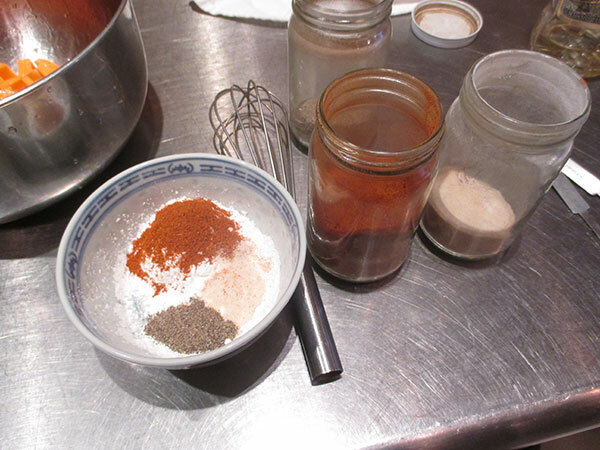 In a small bowl, whisk together the cornstarch, black pepper, garlic salt and smoked paprika. Set aside. Drain the potatoes, turn onto a clean towel and pat dry. 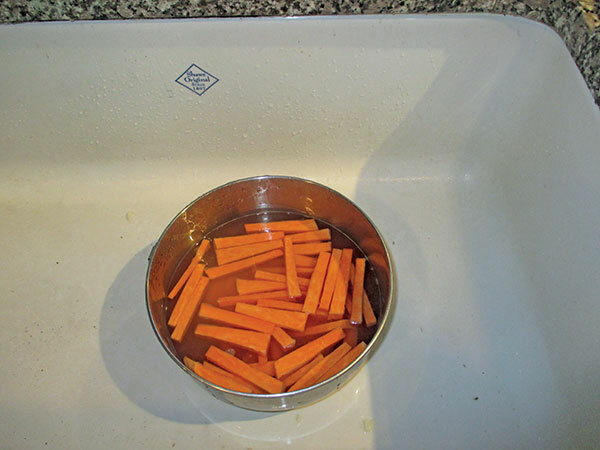 Rinse out the bowl and dry. Return the potatoes to the bowl, add the cooking oil, and toss to coat evenly. 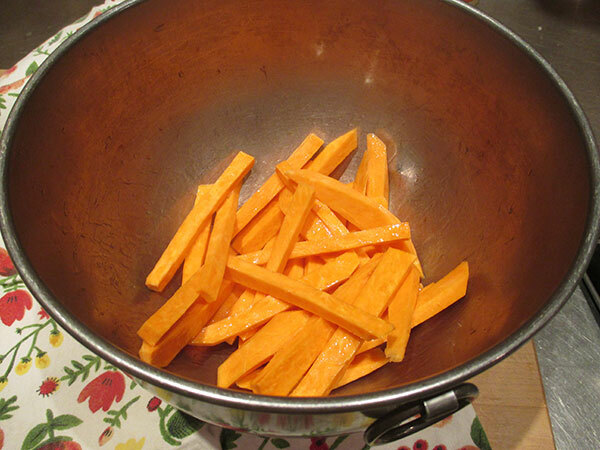 Sprinkle the cornstarch mixture over the fries and toss the fries in the bowl until they are evenly coated. 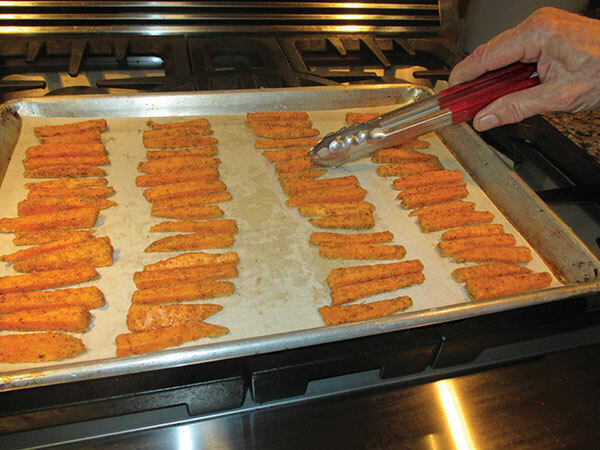 Carefully lay the coated fries out in a single layer on the prepared baking sheet. Bake for 15 minutes. Remove the pan from the oven and carefully turn the fries. Bake for 10 – 15 more minutes, until crispy and nicely browned. Let the fries cool briefly in the pan on a rack. Sprinkle to taste with sea salt and serve. Makes four normal servings or enough for 2 pigs! Nutritional analysis per serving: 178 calories, 1.4 grams protein, 22 grams carbohydrates, 9 grams fat, 182 mg. sodium, 3 grams fiber.